Stage and multimedia is set before audience come in. Figure walks to stage right. Figure situates herself under dimly lit standing lamp, with a microphone stand with wired microphone as well as music stand. Figure is holding a violin. Figure plays Billy Joel’s “And So it Goes” on the violin. To create ambiguous scenarios that may be read in differently valid ways while still maintaining an engaging front. To comment and suggest parallels between relationships and connections. Through a video projection, which extends the space encompassed by the performing figure by the inclusion of an outside scenario playing at normal speed. Through intertextuality – although it is not crucial that all these different elements are recognised for the performance to engage. The song “And So it Goes” penned and performed by Billy Joel, was about a doomed relationship between him and Elle MacPherson. This first connection is rather obscure, but if the link is made, whether through prior knowledge or through lyrics sung, perhaps one might consider the similar disjuncture between the incapable performer and the standards demanded by an institution like the Opera House. (On a deeper level, which is not essential to understand at the point of performance, it might parallel a doomed ‘migrant’ relationship with Sydney, a popular destination for foreign and Australian visitors and immigrants.) Another connection might assume reasons for the stage image of figure in black formal dress to be performing alongside an everyday scene of the Sydney Opera House. 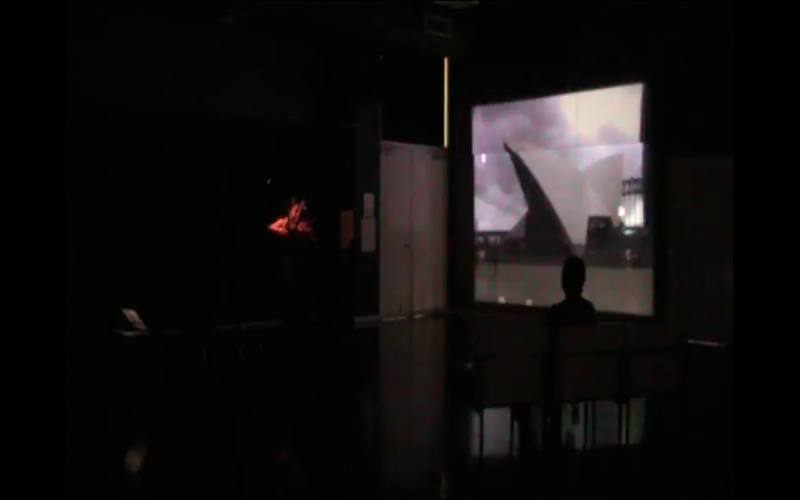 More broadly, through images and references differently associated with ‘performance’ – Present real time performance, figure playing the violin, specific song particularly known for its live recording, architecture of the Sydney Opera House, process of people-watching in the video. It is important that the dynamics of the violin playing be rehearsed enough to play essential sections smoothly and for singing to be audible. However, I should be careful not to master the violin playing so much so that the playing becomes too easy. It should suggest that the player is of basic ability, and the playing is to exist with somewhat of a struggle – because I want an authenticity, I would rather not rehearse how to perform inability. Should I over-rehearse, I would then have to expand on the basic score to compose a more advanced piece to work on – so that I might always retain that struggle.